I asked the question yesterday "Do you need to put more time into your relationship rather than your religion?" This is certainly something the Pharisees needed to ask themselves. In chapter 15 we see them challenging Jesus about his disciples breaking the traditions of the elders by not washing their hands. This was not even God's law it was a ritual, a tradition, created by man and followed as law. Jesus calls these men out as hypocrites and points out the laws they break in order to follow traditions. He uses the Pharisees words against them as he addresses the crowd in verses 10 & 11. He tries to make them understand that it's what comes out of their mouths, not what goes into them that makes them unclean. Jesus uses a parable when he speaks to the crowd, he uses parables a lot (about 40 throughout the gospels). The whole of chapter 13 is a series of parables. I can honestly say that I used to think that Jesus told parables to simplify his teaching. Using every day situations and images to make it easier for the crowds to understand what he was trying to say to them, but this is not the case. They were in fact a revelation of God's word only understood by those gifted with spiritual insight. Jesus gives a further explanation of some of the parables; verses 16-20 in chapter 15 are an explanation of the meaning behind what he had told the crowd in verses 10-11. He also explains the parable of the weeds in chapter 13: 24-33, but many parables are left unexplained. Have you ever read one of these parables and felt that God was speaking directly to you? Have you been reading a parable and known it's deeper meaning? Parables were not told to make things more clear to see but in fact to keep things hidden. It is only the chosen, the spiritually open and aware that can see the revelation of the parable. 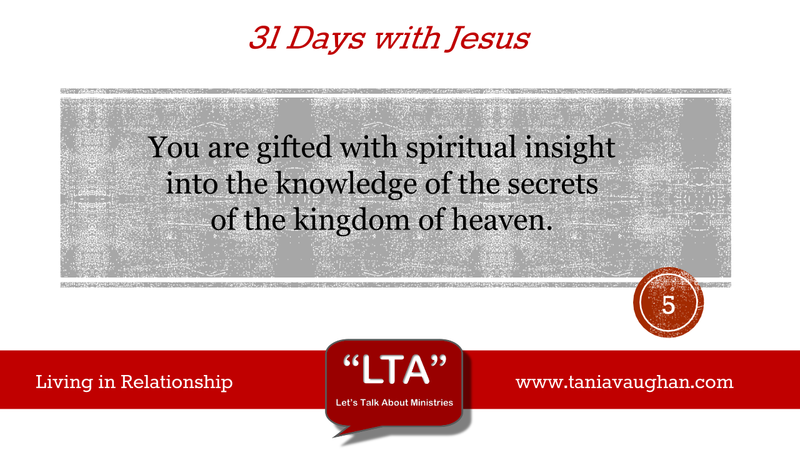 You have been gifted, in your relationship with Jesus and through the Holy Spirit, with spiritual insight into the knowledge of the secrets of the kingdom of heaven. Read over chapter 13: 10-17. Why have you been given this blessing? Because you have received Jesus, you have allowed the Holy Spirit to set up home in your heart and he translates the revelation of God's word to you. God wants you to understand him and get to know him, he wants you to be able to share with others the revelation he gives to you. You will not always read a parable, or any of God's word, and have insight but he does unveil and reveal things through his Spirit (1 Corinthians 2:10), at the right time and when you need to hear it, either for your growth or to share for his glory. It is the revelation of God's truth that brings holiness, not the ritual of hand washing. Despite the old saying, cleanliness is not next to godliness. Jesus is explaining to the Pharisees, the crowd and the disciples that ritual and tradition are not the way to glorify God. Their worship is only based on human rules. Look at the Isaiah verse that Jesus quotes Isaiah 29:13, the Pharisees are giving lip service. God wants our hearts, he wants a relationship with us. Are you serving God through what you do but your hearts not in it? Are there any rules and rituals that you follow that are man made rather than God given? What has God revealed to you recently through his word; is it for your growth or for you to share? Lord, I feel so honoured to realise that you have chosen to reveal the secrets of your kingdom to me. I always want to be open to hear what you are trying to say through your word. Give me wisdom to know how I can grow through what you reveal and guide me to those who need to hear your revelation. Interesting! I thought that the parables was a kind of bible guide for dumbies that JC uses to teach the early believers. I often find the mean of some bible passages hidden or vague - I kind of get the gist of it but feel that i've missed some of the deeper meaning. Your comments about the fact that parables are for those that are blessed with that gift now makes perfect sense. Also in reading these passages I'm reminded of the Parable of the weeds and wonder how many of the weeds will look so much like the corn that they will be fooled into thinking they really are corn! The hand washing ritual is another example of how many prefer to work for their salvation thrugh rules and regulations, as though it's a reward, than by accepting a free gift that we could never earn. We see this clearly today don't we... I love the parables. There is so much depth, with many layers that we can, as you say, only understand through the help and power of the Holy Spirit. It underlines even more our great need to depend on Jesus for everything. Sometimes Anita it is so much easier to follow rules than to try and understand what is not immediately clear. I agree that our dependence on Jesus is key. Reminds me of "Lean not on your own understanding..."